Raya Bisharat is one of the fashion industry’s most established creators. She’s part of a wave of new professionals who are drawing on both traditional and new sources for inspiration. “There’s an immeasurable amount of beauty that can be found in Jordanian fashion,” Bisharat tells SBS. Raya is based in the capital, Amman, but her designs take their inspiration from sources far and wide, including international architecture. One of her latest dress designs makes reference to the curved sails of the Sydney Opera House. Raya says local creators are becoming increasingly confident and independent and that this is being reflected in their work. “Designers have detached themselves from completely copying other designers and have been trying to independently seek their own image and style,” she tells SBS. “It’s a beautiful thing to observe from a more zoomed-out perspective." Raya launched her own fashion label in 2011 after studying at the American Intercontinental University in London and then the London College of Fashion. Her designs have been on the catwalk at international events, such as Mercedes Benz Fashion Week. She designs simple daytime pieces as well as evening dresses and extravagant bridal gowns. While claiming she’s not constrained by cultural boundaries, Raya tries to cater for the "many different beautiful religious beliefs and cultures" in the region. “I embrace these differences instead of looking upon them as burdens,” she says. "In western Amman it is very modern." 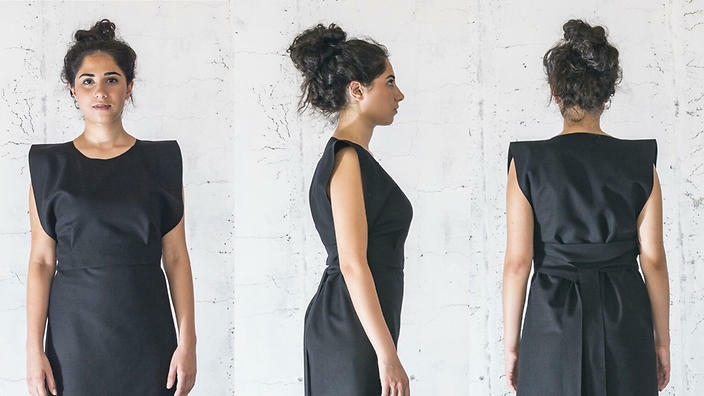 English/Jordanian designer Edelina Joyce Issa is another one to watch. After six years in the UK studying fashion, she was offered a position with Victoria Beckham’s label. Three years later, she moved home to Jordan and launched her own label. English/Jordanian designer Edelina Joyce Issa drew inspiration from the way her grandmother wore a loose cloth as a scarf. According to Edelina, she drew inspiration from the way her grandmother wore a loose cloth as a scarf, impressed by its simplicity and versatility. Using this approach, Edelina played with the design of the traditional Middle Eastern dress known as the thob. Featuring distinctive embroidery, it is worn by Jordanian and Palestinian women and expresses personal details about the person wearing it, such as where they’re from and whether they’re married. Her team designs the clothes, which are then made by refugees, who often draw on the skills they inherited from their mothers and grandmothers. The thob is versatile; it can be worn to a wedding and just as easily while working in the field. Edelina wanted to respect the basic function and custom of the dress while giving it a contemporary twist. “It’s basically just a T-shape, two seams down the side… there is nothing else to it,” she says. Another emerging Jordanian designer, Tania Haddad, specialises in quirky animated prints on staple garments, which make whimsical references to Jordanian culture. She’s also hoping to make a difference to the lives of the Syrian refugees who manufacture her designs. “They can’t work, they can’t provide for their families, they can’t do anything. All they can do is wait,” Tania tells SBS. Jordanian designer Tania Haddad calls on the help of Syrian refugees to bring her drawings to life in garment form. Tania has also created her own label. Her team designs the clothes, which are then made by refugees, who often draw on the skills they inherited from their mothers and grandmothers. If offers the women economic benefits and “something more out of life”, Tania says. It was after arriving home from New York that Tania developed a new appreciation for Jordanian fashion. “The best thing about it is you look at each and every designer and they all have their own style; it makes me really happy and proud to be Jordanian,” she says. Suhad Shtayyeh is Fashion Editor of online magazine, CIIN. She also talent-scouts young designers and helps establish their profile by broadening their professional networks. “I am very aware of the cultural nuances, so what works in the US may not necessarily work here,” Suhad says. “Underprivileged areas are more covered up – they are more conservative and less exposed but in western Amman it is very modern,” Suhad tells SBS. Suhad is quick to point out that there are plenty of exciting fashion developments in the region. For example, Vogue Arabia was launched in October, under the editorship of Saudi princess Deena Al Juhani Abdulaziz. And in December last year, Dolce & Gabbana released a line of abayas and burkas that has been welcomed by both Muslims and non-Muslims. In addition, Dubai is now home to Fashion Forward, a worldwide trade show and Arab Fashion Week.